In this story over at the NY Times that Steve Quayle linked to on his website this morning they report that violence has erupted on some of the now desperate islands in the Caribbean after hurricane Irma roared through with residents speaking of a disintegration of law and order as survivors of the brutal weather assault struggled without power, food and water. According to some reports as shared in much more detail below, whites are being ordered off of the hurricane-ravaged island of Saint Martin in what we see is escalating violence as also seen in the first and final videos below. With much of the state of Florida now in the dark or under water, we weren't the least bit surprised to learn of a looting spree across much of the state as those who 'stayed behind' decided to take advantage of no one else being there to break into numerous unoccupied and unguarded stores, including a sporting goods store that resulted in a standoff with the SWAT team after looters attempted to steal guns. As millions struggle across the state without power, fears that a humanitarian crisis was unfolding have been realized as a still countless number of people have lost their homes and are stuck in shelters while large parts of the state suffered from flooding. 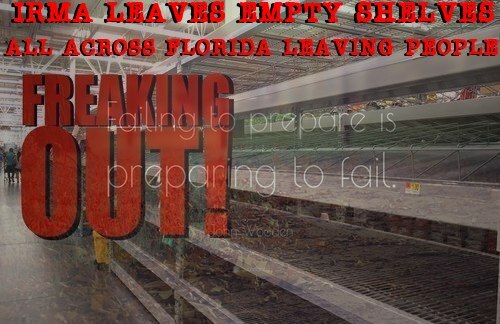 Meanwhile, many of those in the Keys and elsewhere who didn't prepare now have no food, water or power with many communities unreachable to be resupplied. With Irma once again showing all of us the ultimate reason why we prep, we've seen a theme of violence in story after story coming out as society breaks down in storm hit areas and those who've long had no respect for TRUE, 'Constitutional law and order', the very glue that holds America together whether we like it or not, steal TV's and phones and computers and clothes, most of which won't do them any good whatsoever in a 'real' survival situation. With nearly half of the state of Florida now in the dark according to this new story from Fox News and huge work to be done to get the power back up and running in the days, weeks and months still ahead, many areas that are now witnessing chaos and looting because of no power will likely continue to see a 'breakdown' as we also did in Houston as police there arrested 'the lowest of the low'. As we're now seeing in Venezuela and as Steve Quayle has long warned us here in America, no food = no peace = violence = death as he warns us we may soon be witnessing the biggest food shortages in America unlike anything we've seen in history. Steve asked us to post this important notice to ANP readers directly from him that helps to explain the dire nature America is now approaching with even FEMA stretched to the limits by hurricanes and running out of money. IF LESS THAN 1,000 PEOPLE ALL WANTED TO BUY A ONE YEAR LONG TERM STORAGE FOOD SUPPLY FOR IMMEDIATE DELIVERY,IT WOULDN’T BE AVAILABLE FOR SHIPMENT,THATS HOW SHORT THE LONG TERM FREEZE DRIED AND DEHYDRATED FOOD SUPPLY CHAIN IS”. NOTE "SQ- USE TO BE ONE OF THE LARGEST FOOD CANNERS IN AMERICA DURING Y2 K, AND STILL MAINTAINS CLOSE CONTACT WITH GROWERS, CANNERS AND SURVIVAL STORE FOOD WHOLESALERS. HIS COMPANY CURRENTLY SELLS FOOD PACKAGES DESIGNED BY HIM BY "NUMANNA NON GMO AND ORGANIC FOOD STUFFS" INCORPORATING HORMONE AND ANTIBIOTIC FREE MEATS. 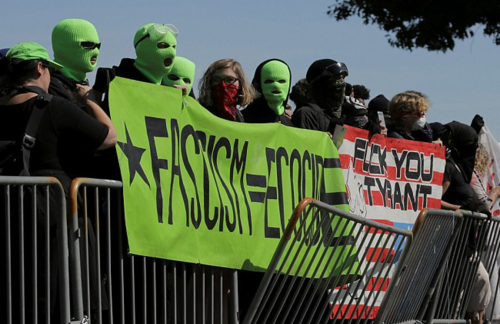 We also see a theme of mass unrest in 'protests' Sunday in Portland which saw antifa terrorists throwing rocks and smoke bombs at police while a so-called 'far-right' man nearly plowed his pickup truck into a crowd, also continuing a theme. With Politico reporting today that so-called 'extremist' groups on both sides are now exploiting loose gun laws and showing up at protests and rallies fully armed when able to, the story also hints at a possible 'event' or false flag ahead with this warning as their subtitle: Authorities gird for explosive clashes between heavily armed extremists in American cities. While some 'protesters' ditched the all-black uniforms that made them look similar to ISIS for a ghastly lime-green while equating fascism to 'ecocide', we'd have to ask them where they've been as Fukushima has turned our Pacific Ocean into a massive cemetary while the food chain there has been completely decimated, as have been billions of fish and animal lives as steadfastly documented in by the End Times Blog Watch from year to year since the disaster in 2011. 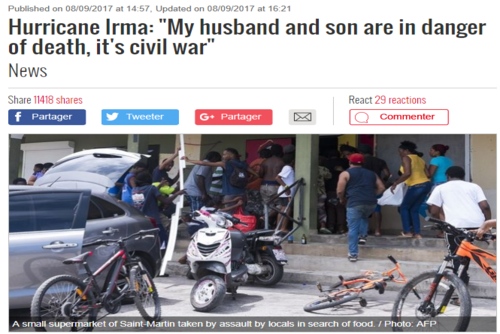 According to this new story from La Depeche in France, there is now danger of civil war breaking out upon the island of Saint Martin after hurricane Irma left the island completely devastated without power, food and water. With gangs allegedly running around the island, accosting residents and warning the whites to get out, we see the worst of the worst coming out in some people at a time when people should be joining together to help each other. As we also read in this story, more deaths have happened on the island than are being reported by the media and as we hear in the statement from one Saint Martin resident below who's lived there for 25 years, panic has set in there. Isabelle, who was born in Toulouse, has been living on the island of Saint-Martin in the Antilles for 25 years. This doctor, who is currently on holiday in Toulouse, normally, thanks to her job, has nerves of steel. But since yesterday, she is in total panic and is calling for help because she fears for the life of her husband and son who are on the Antilles island that has been ravaged by Hurrican Irma. “My husband and my son are in danger of being killed, like a large part of the populatiion. It’s civil war there. We have started to hear some talk in the media about looters who cleaned out the shops after the hurricane, but it’s still very far from reality. Gangs of thugs have robbed the customs house, which was badly damaged, and have stolen the stocks of weapons that were there. Since Thursday evening, they’ve been moving back and forth across the island wearings masks and hoods attacking the houses that were still standing where the inhabitants had taken refuge,” she says, on the verge of tears. Her statements are confirmed by the testimonies of other residents of the island, who tell on social networks of gangs who are smashing in the doors of houses saying “Whites out”. We take an extended look here at that story and see why our entire chain 'arriving just in the nick of time' is so very fragile, especially with the weight of 325+ million people on its back. While due to a massive weather event, what is happening now in the Caribbean Islands and Florida show how quickly things can come quickly grinding to a violent halt. The key here is that, unlike all other commodities, food is the one essential that cannot be postponed. If there were a shortage of, say, shoes, we could make do for months or even years. A shortage of gasoline would be worse, but we could survive it, through mass transport or even walking, if necessary. However, the demand for food would not decrease by a single loaf of bread. Store closings would be felt most immediately in inner cities, when one closing would send customers to the next neighbourhood seeking food. The real danger would come when that store also closes and both neighbourhoods descended on a third store in yet another neighbourhood. That’s when one loaf of bread for every three potential purchasers would become worth killing over. Virtually no one would long tolerate seeing his children go without food because others had “invaded” his local supermarket. 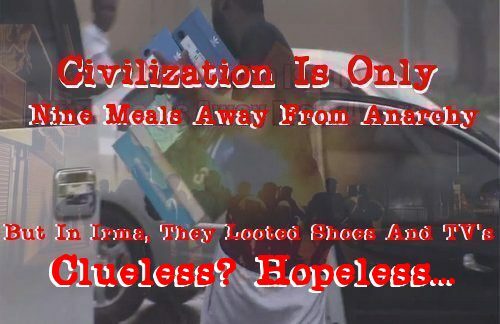 With looters in Miami quite literally making a run on shoes as seen in the 2nd and 3rd videos below, what might happen if it were food that suddenly nobody had and everybody wanted? As we see in the continued description from the International Man '9 Meals From Anarchy' story below, once the food and supplies stopped shipping, the entire thing will come crashing down in a not so orderly fashion with heavy-handed government eventually coming in with their own attempts at controlling the situation. Reminding us of the hundreds of millions who have died of starvation at the hands of socialism during the past 100+ years, we'll close with what America might look like should that worst case scenario arrive here, leaving Americans starving, like Venezuelans, butchering dogs in the streets for everyone to see for their next meals. In addition to retailers, the entire industry would be impacted and, as retailers disappeared, so would suppliers, and so on, up the food chain. This would not occur in an orderly fashion, or in one specific area. The problem would be a national one. Closures would be all over the map, seemingly at random, affecting all areas. Food riots would take place, first in the inner cities then spread to other communities. Buyers, fearful of shortages, would clean out the shelves. Importantly, it’s the very unpredictability of food delivery that increases fear, creating panic and violence. And, again, none of the above is speculation; it’s a historical pattern – a reaction based upon human nature whenever systemic inflation occurs. At that point, it would be very likely that the central government would step in and issue controls to the food industry that served political needs rather than business needs, greatly exacerbating the problem. Suppliers would be ordered to deliver to those neighbourhoods where the riots are the worst, even if those retailers are unable to pay. This would increase the number of closings of suppliers. Along the way, truckers would begin to refuse to enter troubled neighbourhoods, and the military might well be brought in to force deliveries to take place. Suppliers shut down because they’re not receiving payments from retailers. Producers cut production because sales are plummeting. In every country that has passed through such a period, the government has eventually gotten out of the way and the free market has prevailed, re-energizing the industry and creating a return to normal. The question is not whether civilization will come to an end. (It will not.) The question is the liveability of a society that is experiencing a food crisis, as even the best of people are likely to panic and become a potential threat to anyone who is known to store a case of soup in his cellar. Fear of starvation is fundamentally different from other fears of shortages. Even good people panic. In such times, it’s advantageous to be living in a rural setting, as far from the centre of panic as possible. It’s also advantageous to store food in advance that will last for several months, if necessary. However, even these measures are no guarantee, as, today, modern highways and efficient cars make it easy for anyone to travel quickly to where the goods are. The ideal is to be prepared to sit out the crisis in a country that will be less likely to be impacted by dramatic inflation – where the likelihood of a food crisis is low and basic safety is more assured. Language warning and a 'snowflake trigger alert' on the next video below. In the next video below, Mark Dice gives us a parody CNN report on Irma looting.